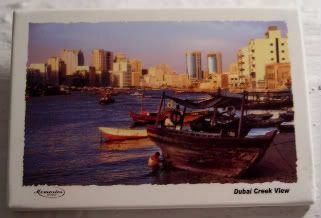 This is the other Dubai magnet my colleague brought back for me. Have I told ya'll that I love you guys for thinking of me on your travels? Very sweet. Thank you. So, from what I've gathered from about a zillion radio interviews, this magnet might be the Dubai that the Doctor Who folks didn't get to see, during their rather cursed, three-day shoot in Dubai. Last night, the BBC transmitted Planet of the Dead, the fourth to last of David Tennant's run as the Doctor. Sniff. But, with all their trials and tribulations, it was worth it the trouble - the Dubai landscape looked amazing, with the sweeping sandy vistas all over the place. I won't bother giving you any reviews - Stuff on TV's done an excellent job of that. Spoilers be there, so go, only if you want to know. I didn't spoil myself - I didn't have to. How much do I love that within two hours of the show airing across the British airwaves, I'd already started watching, and within another two hours, I watched it, and rewatched with the Julie Gardner, James Strong and David Tennant commentary. Ah, the magic of the interwebs. And, no, I won't get into the ethics of downloading/uploading - I'll own the DVD at some point, I traveled to London and Cardiff, spent my money at the Millennium Center for their tour and did the Doctor Who Exhibition, gave my money to the RSC, and to the BBC for their tour, and of course, bought a ton of ancillary products I didn't need. So, yeah, I watched it online. Serves you right for a) not cracking down and b) for not hammering out a deal with BBC-A to air it over Easter - we have the same Easter here, thank you very much, Auntie Beeb. Overall, PotD was a very good episode, and I was happy to see the Doctor in action again. Honestly, though, for most of the show and for every sand dune they walked over, I was half expecting the Doctor and Lady Christina to come upon a very young Reese Witherspoon and Ethan Randall (Embry), and their tongue-clucking friend, lying in the sand.